Financial Toolkit: Should We Scrap the 401K? No one, including himself, would argue that Bradley Birkenfeld, 44, is a saint. The former UBS private-banking executive hasn't hidden the fact that he once bought diamonds with illicit money in Europe and then spirited them to California stuffed in a toothpaste tube, all part of an effort to conceal $200 million in assets on which his client  the Russia-born, California-based real estate mogul Igor Olenicoff  owed $7.2 million in U.S. taxes. But at the same time, almost no one in the U.S. government would deny that Birkenfeld was absolutely essential to its landmark tax-evasion case against Swiss banking giant UBS. The former UBS employee turned whistle-blower exposed the previously hidden world of offshore tax shelters, which cheats the Treasury out of about $100 billion a year. Thanks to his insider information, UBS was fined $780 million, and it promised to "exit entirely" from the U.S. tax-shelter business and to provide the names of thousands of American tax dodgers, from which hundreds of millions of dollars still might be collected. It also led to new tax treaties with the Swiss that should provide unprecedented tax information in civil cases and better access to such data in criminal cases. "I have no reason to believe," says Kevin Downing, a senior Justice Department tax trial lawyer, "that we would have had any other means to have disclosed what was going on but for an insider in that scheme providing detailed information, which Mr. Birkenfeld did." Considering Birkenfeld's help, many observers wonder why the Justice Department decided to arrest and prosecute him. In the end, he pleaded guilty to a single fraud conspiracy count; he was sentenced on Aug. 21 in a federal courtroom in Fort Lauderdale, Fla., to 40 months in a federal penitentiary (to start Jan. 8). Many critics believe the decision to prosecute Birkenfeld, whom some consider the most important whistle-blower in years, sends the worst possible message to other financial-industry insiders who might be considering coming forward. The Government Accountability Project (GAP), a Washington watchdog organization that has extensive whistle-blower experience, says a chilling effect is already apparent: a senior executive at a European bank that offers similar U.S. tax shelters is having second thoughts about going public because of the Birkenfeld case. "No wonder nobody has ever come forward to blow the whistle on the Swiss banks before  and with this mind-set, the government is guaranteeing that nobody will come forward again and disclose information about tax fraud on this scale," says Dean Zerbe, a tax attorney representing Birkenfeld in his dealings with the IRS. Zerbe also served as tax counsel for the Senate Finance Committee; in 2006 it revised the tax code to include whistle-blower protections. 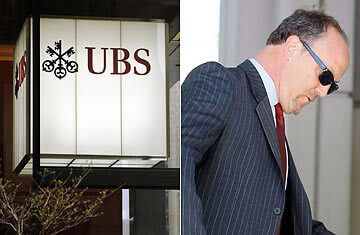 Birkenfeld voluntarily approached U.S. authorities in May 2007 offering details on the illegal tax shelters run by UBS, where he had worked since 2001. When he realized that actual practices were violating stated bank policy, he raised his concerns internally; after being rebuffed and later finding himself in a dispute over a bonus payment, he decided to expose the wrongdoing. After talking with the IRS, Justice and the Securities and Exchange Commission and appearing before the Senate  and being told on at least one occasion by DOJ officials that they were not looking to prosecute him  Birkenfeld was arrested in June 2008 as he returned from Switzerland, where he had been living for the past 13 years, to his native Boston for a high school reunion. Birkenfeld's lawyers deny this, saying he was merely trying to avoid any suspicion that he was cooperating with the government. Also, to reveal more about his clients, they say, Birkenfeld needed some legal cover  like a subpoena, which Justice did not offer  because he would be violating strict bank-secrecy laws in Switzerland, where he was living. What is clear is that Justice was playing hardball. It refused to grant Birkenfeld a cooperating witness agreement  at which point some lawyers would have advised their client to cease cooperation  and instead offered a temporary, so-called queen for a day agreement, giving him much less protection for what he voluntarily disclosed. At one point they even dismissed Birkenfeld as a mere tipster, not a whistle-blower. "Those who seek to be treated as true whistle-blowers need to know they must come in early and give complete and truthful disclosures, with no dissembling or holding back or spinning," said John A. DiCicco, Justice's top tax lawyer, in an e-mail to TIME. It sounds simple. But that view not only contradicts Justice's own statement supporting a sentence reduction  Birkenfeld faced a possible five-year sentence for his work on behalf of Olenicoff  it's also flat-out wrong, says Stephen Kohn, executive director of the National Whistleblowers Center, who has been involved with hundreds of whistle-blower cases. After all, he notes, it would be a serious disincentive if whistle-blowers could be tripped up by inadvertently leaving out some information the government might come across later. Unfortunately, this "gotcha" reflex runs deep in the government, says Jesselyn Radack, a former Justice Department attorney who was forced out of the DOJ after she blew the whistle on the department's destruction of e-mails related to the Bush Administration's prosecution of John Walker Lindh, the "American Taliban." "Basically, the government doesn't like whistle-blowers, and they have demonstrated time and again mountainous bad faith  as in this case, turning a perfectly good whistle-blower-incentive law into virtual entrapment," says Radack, who is the homeland security director of the GAP. There is no doubt that dealing with whistle-blowers can be disagreeable. Some have tainted pasts, and in certain cases some stand to make millions from their cooperation, since they have a claim of up to 30% of funds recovered by the government. (This helps compensate for what can amount to their professional suicide.) There is nothing in whistle-blower-protection statutes that enjoins the government from prosecuting them for any fraud they participated in, but this option, intended for those who masterminded a fraud, is supposed to be balanced with a competing policy to encourage whistle-blowers to come forward. That's not the only potential conflict at play. While the Justice Department has already decided that Birkenfeld isn't a true whistle-blower, the IRS has yet to make its own determination. An adverse ruling "may make more sense legally than it does from a policy standpoint," says former IRS commissioner Margaret Richardson. But if the IRS comes to a different conclusion from the DOJ  and under a new law, Birkenfeld can challenge the IRS decision in court  the UBS whistle-blower could end up collecting the first of millions of dollars from the government even as he sits in one of its federal penitentiaries. Read "Ex-Wives Eagerly Await UBS Tax-Cheater List." Read "Cracking Down on Tax Evaders."